As Veterans Day approached, Team Gold Star mobilized to show its appreciation for the men and women who so bravely offered to leave behind the comforts of civilian life to protect the freedoms that make our country great. We participated in two initiatives that gave us an opportunity to give back to our nation’s heroes, and to make a positive impact on our neighbors in need. During the Volunteers of America Goodie Bags for Veterans event, we filled more than 100 donation bags with supplies to improve the quality of life of homeless veterans in our area. These bags included hats, gloves, shirts and other clothing – and personal hygiene products, food and other necessary supplies – that will be extremely important in keeping recipients safe as temperatures continue to drop in Michigan. 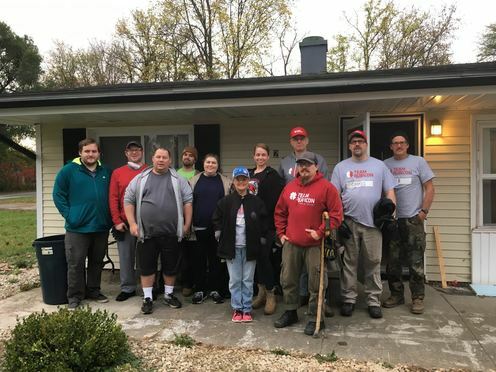 We also paired up with Team Rubicon and other dedicated volunteers to help renovate a metro Detroit home owned by a military veteran. The homeowner purchased the home sight unseen and found out her home would be condemned due to several major issues shortly thereafter. The sweat equity poured into this renovation lays the foundation for transforming this house into “home” for one of our nation’s heroes, and we salute our office manager, Natalee, for leading the charge. Stay tuned for more information about how our compassionate team of disaster restoration experts is making a difference in the communities that surround us. Visit our website for more information about our fire and smoke, water and flood, wind and storm, and contents restoration services – or to get in touch with us 24/7, 365.